What do you really want in a smartphone? Do you want the biggest screen possible? The best camera?  The most elegant operating system or the one that gives you the most freedom to make it yours? How about a phone that learns about what you want, where you are and responds to your gestures, commands and wishes? That is what Motorola wants you to think and it is releasing a smartphone to do just that. The Moto X is the first smartphone designed by both Motorola and Google after the search giant bought the original cellphone make almost two years ago. What is Google’s magic touch? Well, if you put all the power that is Google into a smartphone operating system and add intuitive capabilities that employ the device’s sensors, you start to get the idea. The Moto X’s biggest feature is Touchless Control. If you thought Siri was smart as a way to control your iPhone with your voice, Google is upping the ante to let you use your voice not just to search, but to control almost everything that the device can do, from reading your text messages to opening apps, making phone calls, asking about the weather and more. Voice commands work even when you haven’t turned the phone on or from across the room or in your pocket. Google Now is Google’s semantic search, which tries to figure out what you want to do or what you are looking for before you actually search for it. For instance, today I was traveling to New York City for the Motorola event. Google Now checked my last search for New York City and gave me directions and estimated time of arrival to the event. It knows I live in Boston and like sports and will give me the Red Sox score before I want it. Google is trying to extend this smart search technology into the operating system of the Moto X. You can preview your notifications from the sleeping Moto X and drag one to open the app. Active Display will activate when you pick up the phone or flip it face up. The Moto X’s 4.7-inch OLED display will only light up the pixels it needs to show time and notifications in Active Display, significantly saving on battery life. The camera on the Moto X also responds to gestures. Called the “Quick Capture Camera,” the phone’s camera app activates if you twist a sleeping phone in the air like a corkscrew. The camera will pop up and you can then tap anywhere on the screen to take a picture. That means you don’t have to unlock the phone, open the camera app, configure settings and snap. Just twist and go. A feature called Moto Assist will know when you’re performing certain actions and need to interact with the phone in a certain way. For instance, if you are driving, the Moto X will detect your speed and read you text messages or let you change music. If you’re in a meeting (which Moto X would know from your calendar), it will automatically silence itself and send an auto-reply to any connections. The Touchless Control, Active Display and gesture-based actions are governed by a proprietary Motorola/Google system called X8. Unlike the Android system that runs the rest of the Moto X, Google and Motorola are not planning on making X8 open source. This is their magic, and they’re holding on to it. The X8 Mobile Computing System is really a hardware feature. It is running eight computing cores, starting with a Qualcomm dual-core Snapdragon S4 Pro chip. Four other cores do nothing but running the graphical processing units (GPUs). A dual-core 1.7 GHz Krait CPU runs most of the phone’s other functions. Two cores are focused only on the natural language processor used for Touchless Control and the “contextual computing engine” that knows when you are holding the device and how you interact with it. This is a smart use of hardware by Google and Motorola. The Moto X is not just about speeds and feeds (though it has plenty of power for the casual gearhead); it’s optimized towards performance and feature functionality. Motorola’s Osterloh said that Google is aiming the Moto X at the mass market, not the tech elite or people looking for the cheapest smartphones they can find. The normal, everyday smartphone buying public is the market that Google wants to capture. The Moto X thus manages to be interesting while lacking the pretension of the iPhone, HTC’s flagship One device or Samsung’s Galaxy S4. Google wants people to customize the look of their smartphones. Consumers can choose the front and back colors of their phone and add customized writing on back (such your email, in case you lose your phone) as well as a message to the bootup screen when you turn the phone on. Through a website called “Moto Maker,” consumers can choose from a wide variety of back covers and textures like hot pink or forest green. 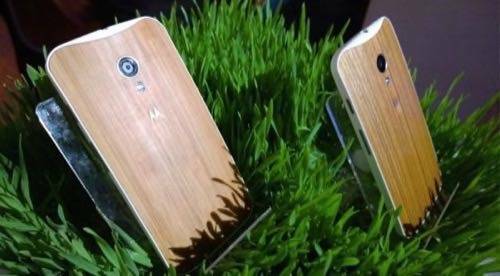 More than 2,000 variations are supposedly possible with Moto Maker. Motorola’s slogan for the Moto X is, “Responds to you, Made for you, Designed by you.” The phone will be assembled in Fort Worth, Texas. 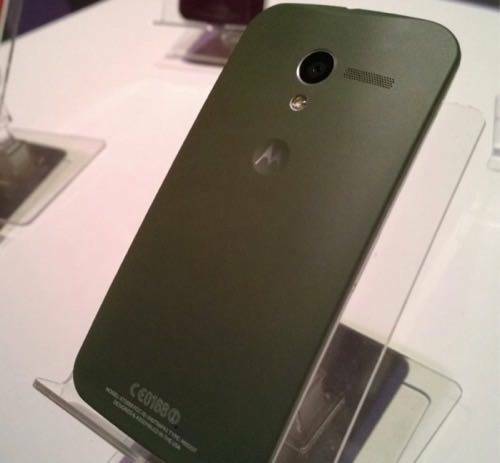 Motorola will certainly attract some customers to the Moto X with the customization alone. The look and feel of the Moto X eclipses that of Samsung’s Galaxy S4 and the features that Motorola has added are simple and intuitive, not scattershot and buggy the way Samsung’s are. 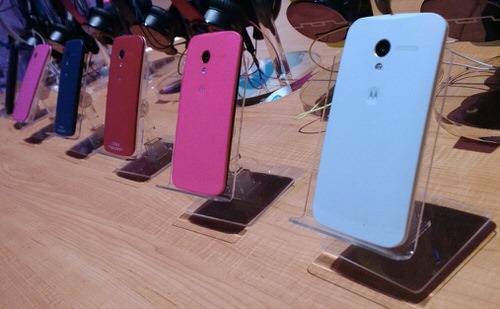 The Moto X is coming to five carriers in the U.S. (the four major carriers plus U.S. Cellular) starting at contract prices of $199 for a 16 GB version ($249 for 32 GB version). 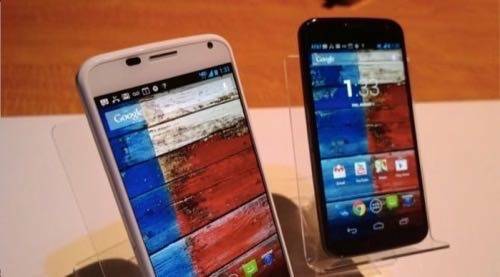 Motorola promises that consumers will get their phones from the Fort Worth factory within four days of ordering. The availability of the Moto X will vary by carrier, but generally will be on the market by the end of August. Does Motorola still have any consumer mindshare to attract people to the Moto X? We will soon see.